What Is The 8th (Eighth) Commandment In The Bible? What is the 8th Commandment mentioned in the Bible? Is it still relevant for today? The false idea that Jesus did away with the Law is debunked by His saying, “Do not think that I have come to abolish the Law or the Prophets; I have not come to abolish them but to fulfill them” (Matt 5:17) and in fact, “until heaven and earth pass away, not an iota, not a dot, will pass from the Law until all is accomplished” (Matt 5:18) which is exactly what Jesus did on the cross, but the nailing of the laws to the cross were the ordinances, rituals, washings, and animal sacrifices and not the Ten Commandments. Nowhere in Scripture does Jesus ever do away with the Law as contained in the Ten Commandments given to Moses in Exodus 20. These laws, written on tablets of stone indicate their permanence, unlike the Mosaic Laws which were only for a time and were shadows of the reality found in Christ and in His work at Calvary. These Mosaic Laws pointed toward the coming of Christ and the High Priest of God, Jesus Christ, sacrificing His own life. Why would we ever think that Jesus did away with laws that God Himself proclaimed? Perhaps we misunderstand which laws were done away with and which were not as the Ten Commandments are the moral laws of God and reflect the holiness of the Lawgiver, Who was God and not Moses. 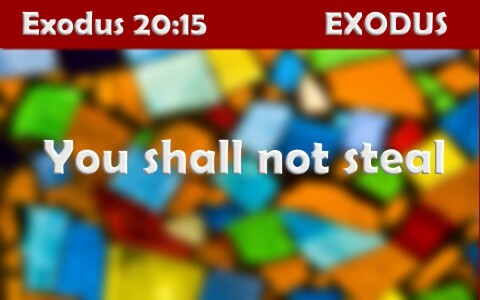 Moses gave the Mosaic Laws but only brought the Ten Commandments, which were from God and not Moses. The 8th Commandment says “You shall not steal” (Ex 20:15) and that law is still in effect today and has never been nailed to the cross. There are many ways that we can break this law and not just by stealing something tangible like a DVD or even a candy bar. Stealing begins in the heart when we covet what others have, so stealing is also breaking the law to not covet someone else’s property (Ex 20:17). Jesus said, “out of the heart come evil thoughts, murder, adultery, sexual immorality, theft, false witness, slander” (Matt 15:19) so coveting often precedes stealing because sin begins first in the heart and as James writes ,“each person is tempted when he is lured and enticed by his own desire. Then desire when it has conceived gives birth to sin, and sin when it is fully grown brings forth death” (James 1:14-15). The temptation brought on by coveting can give birth to the sin of stealing and like all sin, it leads to death. We can steal from others without even taking something specific. One example is leaving work early or taking extended lunch periods. This is stealing from an employer but really, it’s stealing from God. This is how God looks at our work; “Whatever you do, work heartily, as for the Lord and not for men, knowing that from the Lord you will receive the inheritance as your reward. You are serving the Lord Christ” (Col 3:23-24). Since it is actually God Who we work for, we’re stealing from God and not just mankind. The same thing applies to slacking off at work and even taking small items like pens, paper, paperclips home, or anything that seems of little value. It doesn’t matter what the value is because to God, it is still stealing and all thieves will have their part in the lake of fire (Rev 21:8). The Apostle Paul wrote, “I warn you, as I warned you before, that those who do such things will not inherit the kingdom of God” (Gal 5:21). Learning to be content with what we have in life can help us avoid stealing or coveting other people’s goods. James wrote “You desire and do not have, so you murder. You covet and cannot obtain, so you fight and quarrel. You do not have, because you do not ask. You ask and do not receive, because you ask wrongly, to spend it on your passions” (James 4:2-3). When you find you are tempted to steal or you find yourself coveting someone else’s goods (even their spouse), then pray to God and ask for what you feel you need, not what you want. Needs and wants are not the same thing. God will provide for you and expects you (and I) to trust Him. A lack of trust is revealed when we take matters into our own hands but faith is revealed when even in need we still trust God enough to know that everything will work out for our very best (Rom 8:28), even if it’s evil at the time (Gen 50:20). This includes hedging (really, it’s cheating or lying) on our taxes. Paul states very clearly that “you [must] pay taxes, for the authorities are ministers of God, attending to this very thing. Pay to all what is owed to them: taxes to whom taxes are owed, revenue to whom revenue is owed, respect to whom respect is owed, honor to whom honor is owed” (Rom 13:6-7). Even Jesus said “Render to Caesar the things that are Caesar’s, and to God the things that are God’s” (Mark 12:17). We know that stealing is forbidden by God and that God will not leave unpunished those who break His Law, so we must turn away from coveting and stealing and put our trust in Christ. When we truly trust in Christ, we have our sins forgiven and we are completely cleansed (1 John 1:9), and even thou we sill sin (1 John 1:8, 10) and will never be sinless this side of the kingdom, we should be sinning less. If not, confess it and turn away from it and turn to God and ask for His forgiveness. Next post: Who Was A.W. Tozer?